I love pastry! So I was excited to learn that this month’s Daring Bakers challenge was Danish Braid. I have never made puff pastry from scratch and as I imagined, it was very time consuming and a little frustrating rolling out the dough to the right size. My dough was a little sticky and so I kneaded in a just little more flour until it wasn’t sticky. I think this may have been a mistake because by the four rollout the dough was pretty stiff and hard to roll. The end result was absolutely delicious, but I was a little disappointed that I didn’t have the well defined layers of other Daring Bakers braids. 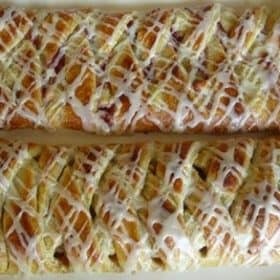 I made two braids, one apple and one strawberry almond cream. The apple was my favorite because it really showcased the flavor of the dough. While this dough was certainly better tasting than puff pastry you buy at the store, it was so time consuming, I doubt I’ll make it again. The apple filling recipe I loved and will definitely use again. Thanks to Kelly of Sass & Veracity, and Ben of What’s Cookin’? for such a great challenge. Spoon the filling you’ve chosen to fill your braid down the center of the rectangle. Starting with the top and bottom ?? ?flaps’, fold the top flap down over the filling to cover. Next, fold the bottom ???flap??? up to cover filling. This helps keep the braid neat and helps to hold in the filling. Now begin folding the cut side strips of dough over the filling, alternating first left, then right, left, right, until finished. Trim any excess dough and tuck in the ends. Spray cooking oil (Pam) onto a piece of plastic wrap, and place over the braid. Proof at room temperature or, if possible, in a controlled 90 degree F environment for about 2 hours, or until doubled in volume and light to the touch. Oh yummy!! I am going to have to make this. love the glaze ot it. I did not even bother to see if I had layers.